The Skinny: This stylized, pure exercise in genre film is sure to please most fans despite being so hard boiled that it almost becomes a comedy. Milkyway Image ’s latest is a welcome addition to their stellar ranks. 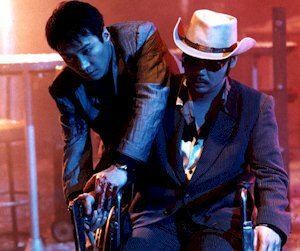 This is another trip to the Milkyway gangland hell: a stylized version of John Woo’s Better Tomorrow world where the violence is more sudden and the atmosphere much darker. Leon Lai and Lau Ching-Wan are Jack and Martin, two ace hitmen in the midst of a gang war. Despite being on opposite sides, the two share a competitive bond that’s akin to friendship. Sadly, they also expect one to die by the other’s handand they get their chance during a botched assassination in Malaysia. Unfortunately, neither can do the deed properly and before they know it, their bosses have joined forces and left them for dead. It’s only through each killer’s sense of honor and perseverance that payback can be achieved, and if revenge requires two graves, then these guys need a whole cemetery. The incredible sense of loyalty and honor that these characters display is what makes them “heroes.” The themes are hammered home so relentlessly that the film nearly enters the realm of parody. Only in a gangland fantasy would characters enjoy a friendship but have no qualms about killing one another later. Ultimately, the narrative of the film is simple: two guys get betrayed and eventually band together to gain vengeance. The plot holes are annoyingly gaping; logic is sometimes forgotten to continue the story.